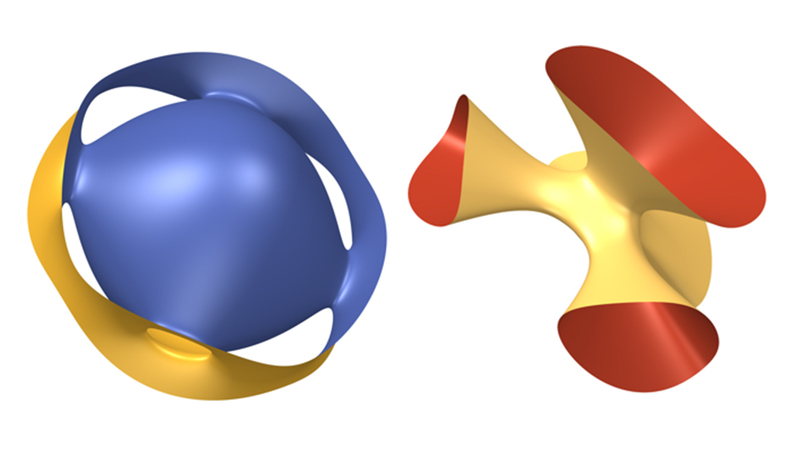 Surfaces in 3D space that share geometric properties and can be described by one equation. Image courtesy of Dr Artie Prendergast-Smith. A Loughborough University academic has been awarded £203,354 funding to conduct research in an area of Mathematics that studies complicated and beautiful geometric shapes using algebraic tools. Dr Elisa Postinghel, of the Loughborough University School of Science, has been named a recipient of the Engineering and Physical Sciences Research Council (EPSRC) New Investigator Award and has been provided with the funding to develop new mathematical methods to describe and classify shapes in four or more dimensions. Classifying shapes by their geometric properties is an area of fundamental mathematical research. Shapes can often be classified (grouped) into basic geometric objects such as points, lines, curves, planes (a flat, two-dimensional surface that extends infinitely), a plane figure (such as a square or circle), or a solid figure (for example, a cube or sphere). However, most shapes occurring in the physical world are complex. Many geometric objects that appear in science and nature are so complicated they defy traditional mathematical description making it hard to classify them. One solution to this is to use algebra to see what geometric objects have in common; this entails describing them as a set of equations. These equations are then used to describe the intrinsic geometric properties of these objects and see how different shapes relate to each other and how they are equivalent. Dr Postinghel’s project is to run for two years and will first focus on the simplest shapes that enjoy symmetric properties such as the sphere, which is symmetric under rotation about any axis passing through its centre. Once she has determined algorithms for these simple shapes, she will go on to more complex challenges, for example, shapes that are formed by combining several simpler ones together. The project’s main focus is on classifying Fano varieties and moduli spaces. These are among the most well-studied shapes due to their beautiful geometry and their connections with theoretical physics and string theory. There have been many attempts to classify these geometric objects but much still needs to be done in order to achieve a complete understanding. This project looks to develop effective methods to classify these objects using a relatively new theory called The Theory of Newton-Okounkov Bodies. Dr Postinghel’s project – titled ‘Classifying algebraic varieties via Newton-Okounkov bodies’ – will make a major contribution to Algebraic Geometry, an emerging area of Pure Mathematics in which the UK has a long tradition of excellence. The study will also put Loughborough at the forefront of research in this area, raising the profile of the geometry work undertaken in the Department of Mathematics. Commenting on the project, Dr Postinghel said: “It is human nature to want to classify things and put them in categories – and sub-categories – that reflect their properties. “For instance, musical instruments are classified into wind, string and percussion but there are different ways of classifying instruments, for instance, a piano is certainly a string instrument if we consider the way the instrument produces sound, but it is a percussion instrument if we instead focus on the technique used to play it.